Recounting the history of the campaign fight to well over 100 people, Katrina Jurn, Melissa Wolfe, John McKenzie and Berna Cummins set out the issues at stake and the serious threats posed to the community and beyond by the development. South Sound is a Marine Replenishment Zone and designated a scenic coastline by the country’s development plan. 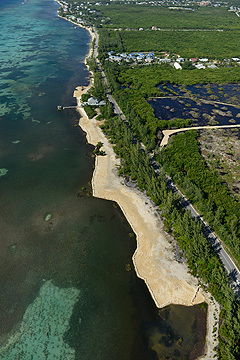 But neither this nor the significant number of objections from residents and environmental activists, or even recommendations from the government's environment department, has prevented the CPA from granting permission to a developer to destroy a recovering mangrove project and recover several hundred feet of eroded coastline. As well as allowing the developer to reclaim his land from the sea, even though the law says that coastal boundaries are not fixed, the Central Planning Authority also granted planning permission in August 2011 for the Emerald Sound development project to cut a canal though the road from the sound inland to the development’s marina, which would require the relocation of the existing road inland by some 75 feetand a bridge over the canal. The activists, known as the Protect South Sound group, have appealed the CPA’s decision over the development but were forced through a lack of resources to give up on their fight to try and stop the land reclamation of some 2000 feet from the sea and several tons of fill has now been dumped by the developer into the Sound. “We were able to get the developer to agree not start the construction of the seawall until the Planning Appeals Tribunal has heard the appeal,” Jurn told the audience of budding politicians but she explained that this was not before the marine area was significantly damaged. Begging for the conservation law and for clearer protections for the islands’ coastline and environment all round, Jurn said the campaigners could not do this alone. She said the precedent it could invite a flurry of applications for people to extend their properties out to coastal boundaries from years before and reclaiming land from Cayman’s already threatened delicate marine environment. A comment was posted that unfairly maligned the developer of the Emerald Sound project and his lawyer. On behalf of CNS I would like to apologise to both the gentlemen for approving a comment which suggested that corruption was involved in the planning approval to reclaim a section of coastline in South Sound. The issue of coastal reclamation in general and in this case in particular is an emotion one and there is strong disagreement about it, but there has never been any suggestion that either the developer or his legal counsel have not adhered strictly to the correct and legal process. If the coastal boundaries are not fixed by law then how could this have happened? Yes, it was indeed bad luck for the developer to have lost land due to natural processes but many other people on the island also lost land, house, home and property during those same natural disasters also! We need to sort our selves out, Cayman – we are destroying one of the only resources we have and not many people seem to be blinking twice about it. Sure, we may have a strong banking and economic sector since we are tax free but as we have all seen – this side of our industry is very much dependent on the global economic climate. If we protect our oceans, reefs and wildlife they will be with us forever; not only for us to enjoy but for tourists to come and enjoy as well! I am in favor of the Red Bay cruise berthing facility but this will never be with the South Sound group already reading the riot act to politicians. It is unfortunate this small group holds so much power in the country. “Even though the Law says that coastal boundaries a not fixed”? Really?? According to who? The former Chief Surveyor and the Director of the DoE? Last time I checked they didn’t have law degrees. And from what I recall, even the lawyer that was interviewed by CNS for a previous article didn’t come across as being certain about it. Maybe you should ask yourselves this: if the concerned citizens of the protect south sound group were so certain of that being a sound legal position, why did they abandon their Grand Court action where they were seeking an injunction? Certainly the Grand Court would have been by far the most appropriate forum to determine that seemingly difficult issue? Could it be that they realized that they were at a stage that they had to put their money where their mouths were? Could it be that their lawyer actually went and read section 18 of the Registered Land Law instead reading in isolation the often touted Section 26 of the Land Survey Regulations and realized what the true legal position was? No, they say that they were going to leave it to the Appeals Tribunal and now it appears that they are trying this on to prejudice that process as well. And after all, what are they asking these politicians and would be politicians to do? To interfere with the decision of a statutory board, simply because they didn’t like the outcome? Isn’t THAT inciting corruption through political interference with a statutory tribunal? Maybe they better take some legal advice on that as well. And try and find someone who has relevant local legal expertise, and get them to commit to their position in writing. Then you can make statements about what the legal position is. The Grand Court is the appropriate place to settle planning matters AFTER the Planning Appeals Tribunal has dealt with them – and not before – which is why they are going to the PAT. If the PAT were to rule unsatisfactorily either party could then take it to the Grand Court. They are raising awareness about what has happened and the impact on coastal development – there is no crime in sharing knowledge and awareness raising. There is nothing inappropriate that was said or asked of these politicians or the concerned residents who attended the event. Knowledge and facts my friend. Its not a crime. The world could use more of it. For clarification purpose, Protect South Sound (PSS) have not 'given up their fight to try and stop the land reclamation', PSS very much intends to fight for this, however had to settle the legal injunction. The Planning Appeals Tribunal (PAT) is where PSS will focus their efforts and resources on in hope that they (the Tribunal) will see fit to overturn the erroneous decsion of the CPA. I don't understand why PSS would settle the injunction. They should have continued to fight, what is there to save now? Seems like crying over spilt milk. Either way, do we need to continue to funraise or have we raised what we need to contest this? The rest of the Cayman Islands natural coastline. Thats fairly significant. At least in my humble oppinion. Shall we put CPA in the same class as ERA,CIAA, etc., etc.? Hear, Hear! Let's FLOOD the Auditor General's voicemail and demand that CPA be investigated today. I'm sorry, but how can Construction Company owners, Harware Store suppliers (for all those new toliets and taps) and Heavy Equipment Suppliers actually SIT on this Board? Talk about conflict of interest !?! **If your business profits in any way from the construction of new homes then you have a conflict of interest, period. Protect our Land for Public use, our waterways, our wetlands…yes, build, but do it with some thought. The CPA Board needs to be filled with honest community members. It should comprise of accountants, lawayers, chartered surveyors (albeit close to construction profits?) long serving employees of the Lands & Survey Department and dare I say it??? "Qualified CITY PLANNERS not just builders". Yes, and someone from the National Trust needs to sit on the CPA Board to insure the wetlands are protected. Other qualified people would be lawyers well versed in strata laws and an expert on Roads…. "PLANNING" needs to look at ALL aspects of the LAND, not just pocketbooks. The most successful countries have well planned communities. Just think….? What if CPA had deemed sidewalks (pavements) for all residential streets? Our children would not be walking in the road! Every single neighborood for over three decades has been poorly planned and simply pushed through due to greed and fast progress. Don't get me wrong…build, build, build! but THINK a little first. People of Cayman who complain that YOUR land is being sold and developed? It is time YOU told your politicians that you will no longer stand for conflict of interest crony Board members! Call the Auditor General and let the Crony Board sweeps begin! Yes, and while we are changing the planning board to accountants, lets change the Monetary Authority board to taxi drivers, NRA board to a group of Vets and the Marine Conservation Board to Cayman Brac fishermen. The "would be politicians" must be exhausted from the lip-service these people require. Look at the rest of the coastline – both in the distance and in the foreground of the photo – this section of filled in coastline is clearly unnatural! Does not take lawyers or engineers to see that. Yeah, yeah. Nothing new here. Politicians conducting political posturing prior to the election to garner votes, and once the election is over, they'll do nothing at all as usual. Don't get your hopes up South Sounders, they're only there and showing any interest because they have ulterior motives. The Planning Board is run by a building materials merchant and a building contractor. Is there any surprise that this was approved? You know all these rich folks in south sound have done is stop jobs for Caymanians. They don’t want any body else to come live in their neigbourhood. After they dredged 80 acres of the sound in 1970 and moved 3000 feet of road so they can put their fancy homes on the beach ridge they are now complaining. I hope the aspiring candidates don’t fall for this. You hit it right on the nose, it only effects the environment when it effects thiers, people always pull this out of the hat when its something they personally don't like or want in their own backyyard. They complain about mangroves as if a seawall wouldn't offer better protection.. The majority of people involved in Protect South Sound are generally active in the community when it comes to opposing matters that are wrong or unjust – they are involved in environmental issues island wide – and other social issues. It is natural that the people who will take the lead on an issue are those most directly affected e.g. West Bay Road closure, East End seaport, Brazilians advocating for the protection of the Amazon etc. Totally agree with the comment. I hope they are the same persons complaining about South Sound and are backing the folks up in the West Bay area re Road closure. Long before these lovely individuals arrived on island and lived on Sth Sound the area was just mangrove and all of a sudden houses starting popping up all over the place. I doubt if they were complaining then and of course did not concern themselves with what the Indigenous Caymans thougt about the development at the time. Amazing. Personally if not in support of Caymanians re housing, roads, jobs, etc you won't be getting my sympathy and I am sure I speak for most born and bred Caymanians and NOT PAPER STATUS I hasten to add. So very ignorant you are……the majority of the folks in South Sound want to see the Conservation law passed to protect greedy developers all over the island…but one step at a time……as far as jobs for Caymanians go….the developer has a track record of importing foreign workers to do such projects….the only job our fellow Caymanians will get is clearing up the mess afterwards!!!!!!! Ha ha.. let me guess, ALDEN MCLAUGHLIN elected member for George Town was absent as usual. I hope next time people know who really stands for their cause when May elections come. CNS: He was there, along with Lucille Seymour, Joey Hew, Ray Farrington, Marco Archer and Kenneth Bryan from the PPM. And also well attended by several UDP candidates. Thanks for the exposure on the matter, CNS. Most refreshing, sincerely. Thay all stand for something during election time..And then sit on thier arses afterwoods..
You guessed wrong, Alden was there. Why is it that when you don't make a hullaballo about things that people ignore your efforts and when you do make a hullaballo about things people say you're too much? Alden, I don't envy you at all. Hats of to you, sir!